This year, I’m attempting something different for both of my daughters’ birthdays. Rather than get them a pile of store bought stuff they’ll love opening, play with, and forget, I’m trying to be a bit more thoughtful. They each usually get one larger present. 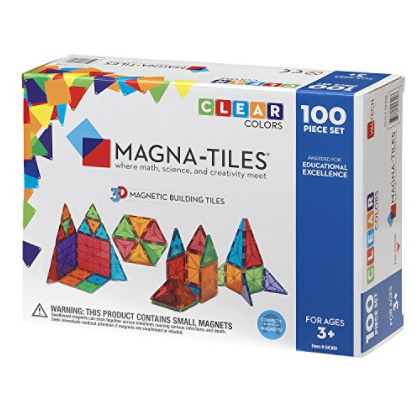 One year, this was magna-tiles. Who knew magnetic plastic could be so expensive?!? For the hours of play over the last two years, worth it, though. Another year, it was a My Little Pony castle. I wish this would’ve been as worthwhile as the magna-tiles. This year, both of their main presents are being created by artists from Etsy. It’s required me to plan well in advance of birthdays as most artists have a four to six week lead time, but I’m hoping it’ll be worth it. I want to give them something unique, but it also feels right to know you’re supporting an artist rather than a plastics factory. We’ll see how it goes when I get the items, but so far, almost everything I’ve bought from an artist on Etsy has been spectacular. You can tell that they care about what they’re making. Of course I’m hoping the girls will love what they’re getting. 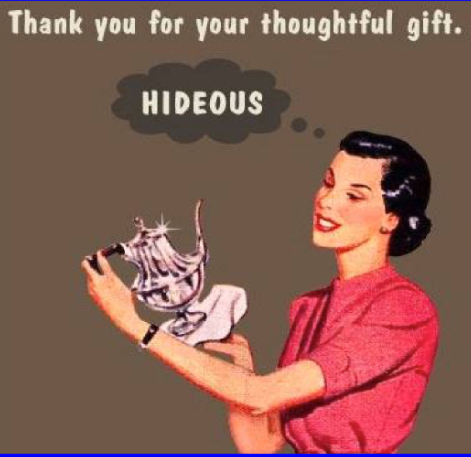 We’ve all gotten gifts like this. Okay, it’s not going to be as bad as shown above. These are artists, not me, making the gifts. More than just liking the gift, I’m hoping it’ll spur their imaginations and bring them to new worlds. I love watching them play with dolls, action figures, or blocks. Listening to the stories they’re making up, the reason they’re doing whatever they’re doing. They’re literally acting out all the amazing imagination running through their heads. Making their pretend worlds come to life. Frankly, another thing I really appreciate about Etsy is that nothing I’ve ever bought there makes noise. Or has an on/off switch. Or requires batteries. The gifts I’ve selected will appeal to things they already like, but it will require the girls to use their imaginations. While there’s nothing wrong with electronic toys, and goodness knows they’re going to need to know how to use electronics. DD1 will already be using an iPad in her kindergarten class. But I also feel like this has gone a little too far. Does the fisher price school bus have to make a series of noises? Does every stuffed animal have to talk? Volume controls and on/off buttons are nice, but does every toy need this in the first place? I like to see the kids use their imagination. I love seeing where it takes them. They even snitched my stuffed green dragon, which I still haven’t gotten back, for some escapade or another. They love that dragon, and all it does is sit there. No roaring. No talking. No breathing fire. Just a plain stuffed green dragon to take them wherever their imaginations want to go. How about you? Do you find your kids or grandchildren toys to require too many batteries? What do you think of current toys or the classics? Ever got a child a handmade gift before? How did it go? I wish the above weren’t so true. Although, she is figuring out a fork. Just not as fast as she did my iPad. There is a ridiculous amount of guidance out there on how much “screen” time you should allow your children to have. For the longest time, children under two weren’t supposed to get any. Even if they had older siblings. 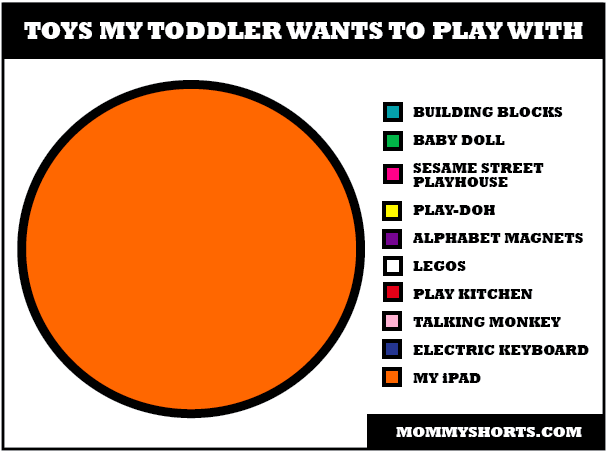 We tried to follow this with our first child, and I swear she could smell the iPad. She could find it tucked away in the back corner of a dark room, and she hated dark rooms. She would find it and come toddling out with it triumphantly clutched in her tiny fingers. Our saving grace was that she loved being showered with attention more. Loved being read to, “helping”, anything that put her front and center of our world. So, we could get the iPad away from her without a complete meltdown. I know, kids cry, etc. But when you work, you’d like your few hours with your child to be as nice as you can get them without a tug-of-war over an electronic device every day. At a neighborhood block party, I asked some of the other moms how they kept their little ones away from their TV and iPad. They offered me a cocktail, told me to sit down, and then explained that they didn’t. If the pediatrician asked them about it, they’d lie. Most had older children, and they said it just wasn’t possible or reasonable. They then informed me our school district gives kids an iPad starting in kindergarten to do all of their homework, reading assignments, etc. Still, I tried to keep her away from TV and the iPad for a while longer, but the realities of making dinner, doing laundry, and washing the dishes won out, and we allowed her to have Sesame Street. That mostly made her happy, and she would drop TV like a rock the moment we could again give her our undivided attention. DD2 is an entirely different child. She likes attention, but on her terms. She laughs, gives hugs, and even pets you to soothe herself, but she wants “alone” time. We were terrified at first that this was a sign of autism, but our pediatrician reassured us. DD2 was normal. DD1 was exceptionally high maintenance. However, this means that if DD2 gets a hold of an iPad, there is no getting it back without screaming. It’s like stealing her favorite toy. Which, in a way, it is. So, we compromised, as parents so often do. She’s at a formal daycare all day, so she gets no screen time during the day. We figured a little at night while we’re making dinner won’t hurt anything. 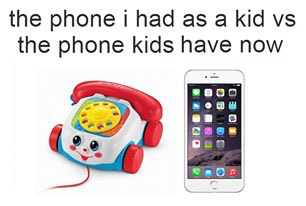 And if I’m truly honest, I’m concerned not introducing kids to technology early enough puts them at a disadvantage to their peers. We took our old iPad and removed almost everything from it except some games specifically designed for her age group that her therapist recommended. These were games she was only allowed to play while she stood on uneven surfaces, for example. She loves them, and they do seem to be teaching her things. We still have story time and snuggle time. Playing with Fisher Price Octonauts time, Duplo time, and Magna Tiles (Magna Tiles are amazingly fun, even if you’re a grown-up). To that, we have added TV time and iPad time. How about you? 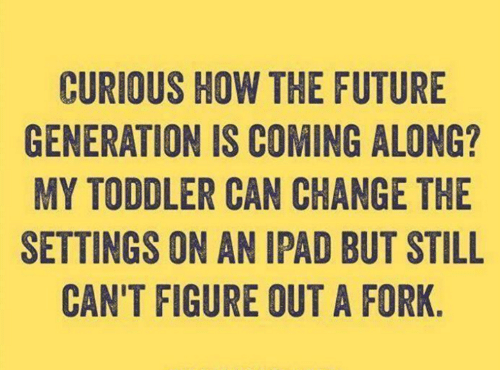 Did your kids know how to work an iPad before a fork? Did you allow them to have any TV? Could you lure them away from an iPad with books?